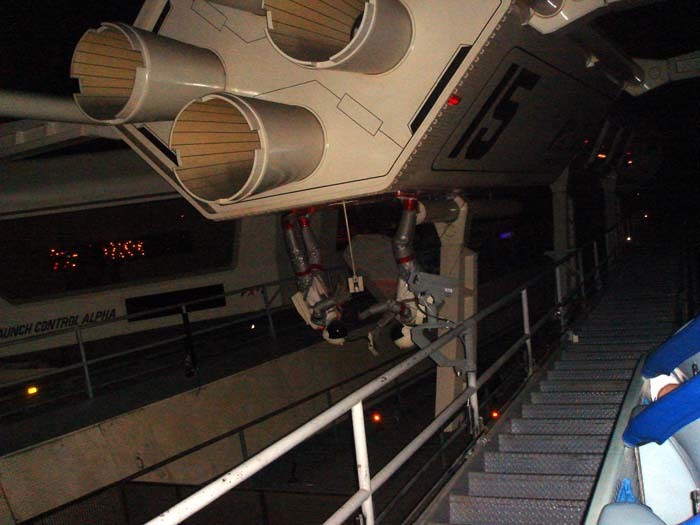 they also need to fix the effects for the people mover when its inside space mountain, half the time your literally in pitch black darkness, for awhile there was white and green like glowing stars/effects, and soundtrack playing, then it all was turned off. I'd love it if they'd add some movement to the figures on the Space Mountain lift hill. Move it to Future World during the inevitable rebuild and change the story so it's a trip to Brava Centauri. Calling them "figures" is quite the stretch. I don't think anyone wants to see those department store mannequins moving any time soon. I like my current nightmare-free dreams at night. Jokes aside, the whole lift hill section(and the entire ride) needs a facelift. It was always a confusing section to me. Are we in space already? According to the astronauts spacewalking on the spaceship above you we are, but according to the mission control you creep by we're counting down to launch and then suddenly you're in space. Not to mention how much I miss being able to see the cars zipping around above our head before you board your vehicle for takeoff. Always got me excited as a kid being able to look up and think "that's going to be me soon". How about we get the lighting on the lift fixed and dust cleaned up first? I don't think anyone would argue with you. Keep the same layout and seating setup. I was just thinking of those conflicting ideas recently. The way I think of it is you're being launched from the space station directly into space. I love Space Mountain the way it is- especially the lift section with the old school props and lighting, and am glad it hasn't changed. To me, it feels more realistic than the obviously CGI ceiling in the loading area and the pixelated screens in the queue. You know, I wonder if TomorrowLand didn't get the love it needed when the movie bombed out, thus robbing Disney (Iger) of a movie IP to redo the land around. Now they just don't know what to do since its harder to move some IP in there that doesn't just become Toy Story - Space Rangers & Tron Land. Another failing of only resorting to IP for attractions and not getting bold with something new. Blindly bashing IP qua IP is silly. If something fits aesthetically and thematically, there's nothing wrong it. Monsters, Inc.... doesn't really fit in Tomorrowland. TRON, on the other hand, is exactly perfect. I totally understand how that is in today's world a very pricey objective, but so was DLR in general. I'd just like to hear actual plans (I'm impatient; and yes I know D23 is coming). They seem to just close things (Stitch) and then fumble trying to figure out what to put there, and then they paint a lot of things. But what's the rhyme and reason? Do they have an ACTUAL plan? That's been one of my biggest problems. It all feels thrown together at times. Like, what's the goal with the orange creamsicle and white on the restrooms? Not complaining, but it all just feels so random (even if it's not). Anyone else feeling this way? Other parks get their plans laid out. We're left kind of guessing what's going on. I assumed the original poster was referencing the mission control mannequins as seen below. The thing is, the coaster itself is nearing the end of its lifetime and should've been rebuilt back in 2009. I'm all for the retro stylization of it but replace the tracks, supports, and trains. The props should stay (and were supposed to back when it was supposed to happen) and the addition of a in-car soundtrack would've been added instead of the Crappy-o-phonic sound system that works when it feels like it right now. I find it funny how the one major change to the queue was reverted recently. All of that work to just dump it in the end. I love the aesthetic of WDW's SM, but it needs love because right now it looks (and rides) bad. Hilariously enough, the version they ran at Halloween without any lighting was more enjoyable because there wasn't any light-bleed anywhere and they just had some random song blaring over the speakers. You couldn't see the flaws with it anymore. Make it some sort of science experiment/technology exhibition hosted by Prof. Farnsworth? I'm in!